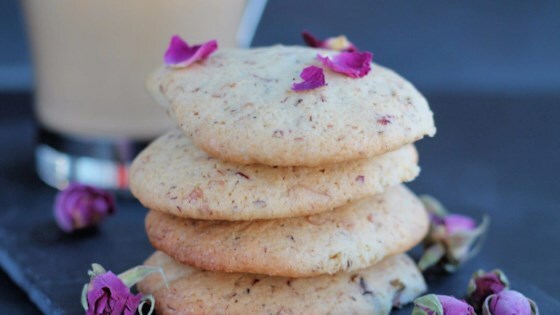 "These cookies feature both rose water and dried rose petals for a delicate rose flavor and pretty pink flecks in each bite." Combine sugar and butter in a large bowl. Beat with an electric mixer until light and fluffy, about 5 minutes. Beat in eggs and rose water. Stir in rose petals. Combine flour, baking powder, and salt in a separate bowl. Mix into the dough. Cover and chill dough for at least 1 hour, or overnight. Preheat the oven to 400 degrees F (200 degrees C). Line baking sheet with parchment paper. Roll out dough on a lightly floured surface to about 1/3-inch thickness. Cut into shapes with a shaped cutter, or simply cut into rectangles or squares. Place cookies 1 inch apart on the prepared baking sheet. Bake in the preheated oven until light and crisp, 6 to 8 minutes. Cool completely before serving. Sweet, floral, and delicate cookies that will make tea time bloom. I used gluten free flour. Thank you for the recipe.